Markets Of Sunshine: Florida Vendor Events: Lyme Disease Awareness, Foster Care, Sustainable Living! Florida Vendor Events: Lyme Disease Awareness, Foster Care, Sustainable Living! Markets of Sunshine vendor events is about educating the community in three categories. Lyme disease, foster care and sustainable living. Why Lyme disease? I have chronic Lyme and know first hand how it turns your life upside down overnight. The first 3 years of your treatment make you wish you were dead. Then suddenly you see the light at the end of the tunnel. You're not going to die, you are going to live! And, better yet, you want to live! I have a mission to help people with Lyme to learn how to think positive and find true happiness! Sustainable living became my passion over 15 years ago! Not long after I converted to this healthy lifestyle I found Mary Jane's Farm Magazine, shown above! To subscribe to this organic lifestyle magazine, click here! Get your copy at our event on August 30th in Orange City, FL. 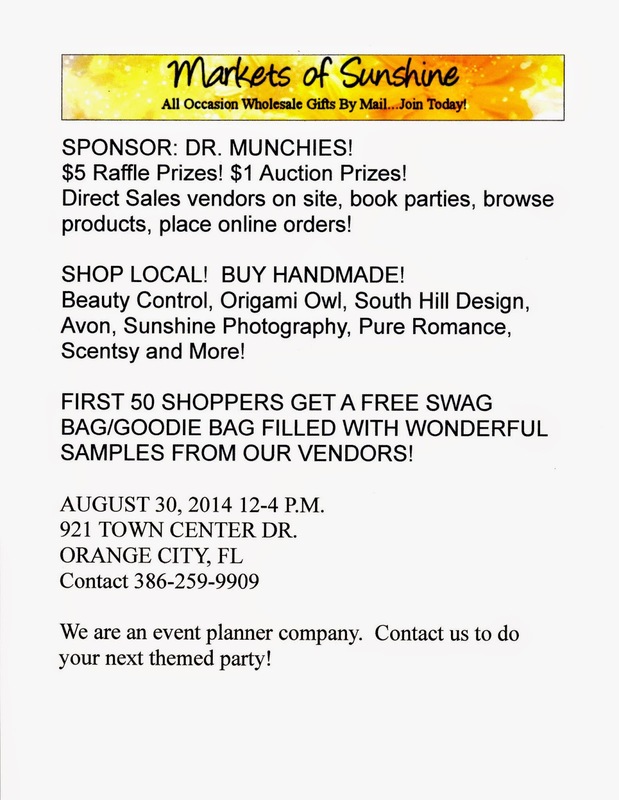 We'll be at Dr. Munchies serving up the latest and greatest in direct sales products! So, come on out and support women in small business and your community! Vendor Classified page, click here! as 1, 2, 3 just click here to get started! All current vendors get first pick at all of our events. Join them and get in on the hottest vendor events in Florida!